💌 Happy Valentine’s Day, Commanders! 💌 The Level 13 M12 GMC and Level 11 AH-64 Apache are here! As with the recent unit level cap releases, your Level 13 M12 GMC and Level 11 AH-64 Apache will also feature improved stats and no increases in battalion space requirements. As with any improvement in power, there are increases in cost, production time, and repair time. The Level 13 M12 GMC and Level 11 AH-64 Apache upgrades require a blueprint that can only be purchased during Hardware Event Weeks in the Hardware Prize Store. We will continue to release similar levels in this catch-up mechanic boost to more core units going forward. Ever hear of a spider hole, Commander? Some of your troops had the bright idea to–get this–dig a hole in the ground and ambush incoming enemy troops. The engineers rigged a way to hook some of these into our command and control system, so now we can deploy Strike Teams to perimeter points around our base. As it turns out, it isn’t expensive to dig a hole in the ground. Ambush Point Blueprints are available in the Event Prizes Store for only 1000ONP. 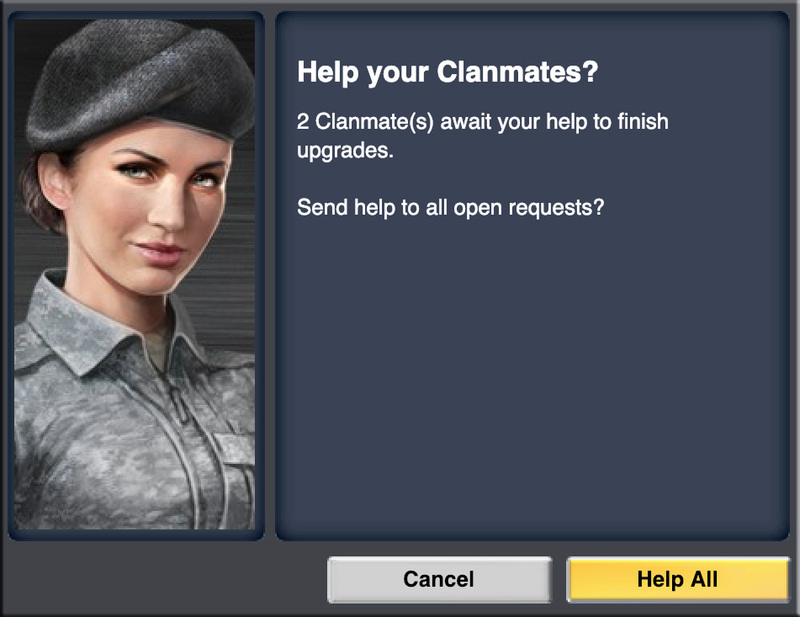 A Building or Research help request will now require only 7 clan helpers per request instead of 10. Smaller Clans rejoice! Having trouble getting your Clanmates to see and respond to your help request in a timely manner? All members of a Clan will now be notified upon login with how many open help requests are active within their Clan, with the ability to satisfy all open requests with the click or tap or a button. Never miss another request! Have more feedback to share? Let us know over on Clan HQ. The Days of Valor End of Season Clan Tournament has finished, and Season 9 is now Live! Welcome to Season 9! Going into the new season, all Leaderboards and PvP Points are reset, meaning that it’s a fresh start for YOUR Clan to be the new the dominating Clan of Gundar, and win the Seasonal Clan Tournament Grand Prize of 10,000 Gold for your Clan at the end of the Season in 3 months from now. Does your Clan have what it takes? Why are just the Infantry having all the fun with the new training opportunities these days? It’s time to give our Armor Unit Research some lovin’. The Level 13 GPW is here. As with the recent L13 Infantry releases, your L13 GPW will also feature improved stats and no increase in battalion space requirements. As with any improvement in power, there is an increase in cost, production time, and repair time. The Level 13 GPW upgrade requires a blueprint that can only be purchased during Hardware Event Weeks in the Hardware Prize Store. We will continue to release similar levels in this catch-up mechanic boost to more core units going forward. Good hunting, Commanders! From January 3rd – January 10th, rally your Clan and head to the regional map for your chance to be the strongest Clan of Season 8! Tournament ends on January 10th, 2018 at 1700 GMT, at which point winners will be announced, prizes awarded, and leaderboards will be reset for the new season. 🎶Gonna get by with my friends, ah, with a little help from my friends…🎵 hmm? Oh, sorry Commander, had that stuck in my head. First off, Happy Holidays! Second: Good news! We’ve received a software update for our command and control systems that allows us to get construction and research help from our clan mates. Any time you want to speed up a project, just ask for help. If ten clan members chip in, you’ll get a nice chunk of time shaved off. Future Transmitter levels will raise this cap. Clan members must be on the same multiplayer map to use this feature. Group up and dominate, Commander! The Elite Nimr L6 Stats Blueprint is now available in the Event Prizes store, allowing you to upgrade the Nimr’s Health, Damage, Mine Defense, and Blast Defense stats to Level 6. Unlock the blueprint as part of this week’s ONP Event by spending ONP in the Event Prizes store!